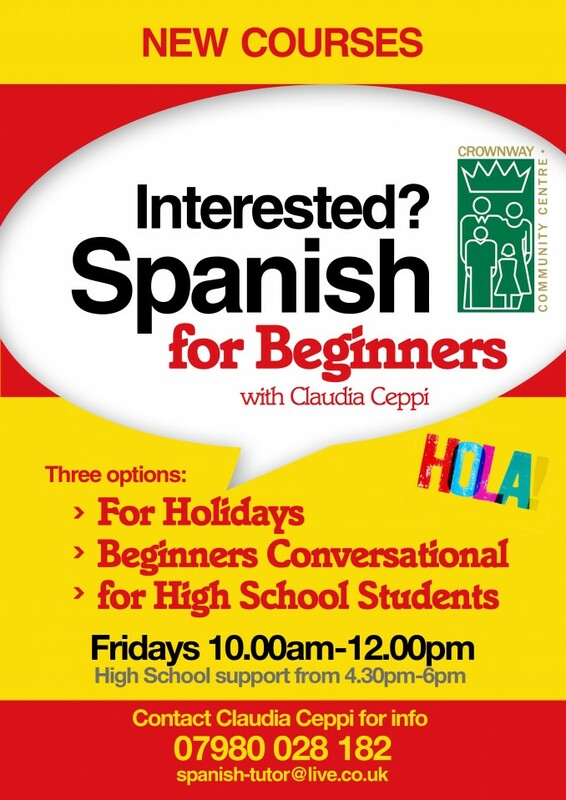 Crownway Community Centre is scoping out interest around Spanish classes for beginners. Tutor Claudia Ceppi has been running a group at the Centre for over 12 months. She has been teaching Spanish for over 10 years and received her teaching certificate from Liverpool John Moore’s University. Teaching at St Helens College under the tutelage of mentor Miguel Montanez (with 35 years experience), Claudia then moved on to Age Concern at the Mansion House and worked with groups at Haydock Library for several years. Claudia has just completed a Conversational Spanish at Crownway Community Centre this December. If you are interested in any of the following three sessions (Holiday Spanish, Beginners Conversational or High School study support for young people), please call Claudia on 07980 028 182 or email spanish-tutor@live.co.uk for further information. Cost per session is to be arranged depending on interest.